Keyboard cases are nothing new and most fell short for not being well implemented together with the iPhone 4. 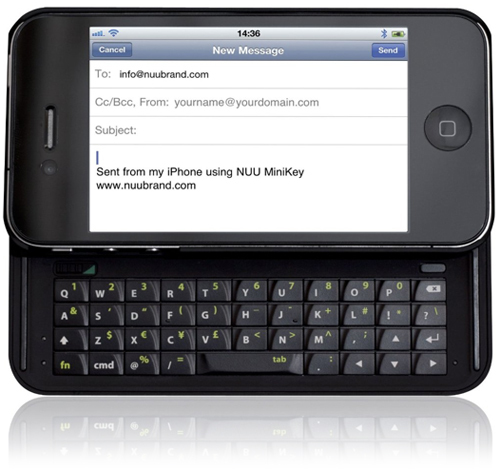 Nuu seems to change that issue around with their new MiniKey slider keyboard case for the iPhone 4. The MiniKey has it all, good looking backlit keys, Bluetooth connectivity, text-editing shortcuts, long battery life and an automatic sleep mode. The Nuu MiniKey snaps to the back of your iPhone 4 and acts just like any other protective case offerings semi-protection and does not interfere with the iPhone 4's functions and ports. BlackBerry users who just jumped onto the iPhone 4 bandwagon and miss their tactile key feedback will particularly find the MiniKey as a useful companion. The Nuu MiniKey is available right now for $79.99.